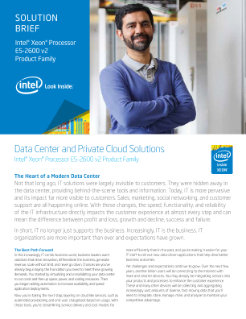 Learn why the Intel® Xeon® processor E5 family provides the best combination of performance, cost-effectiveness and built-in capabilities for your data center, your private cloud and your business. Not that long ago, IT solutions were largely invisible to customers. They were hidden away in the data center, providing ...behind-the-scene tools and information. Today, IT is more pervasive and its impact far more visible to customers. Sales, marketing, social networking, and customer support are all happening online. The speed and functionality of the IT infrastructure directly impacts the customer experience at almost every step and can mean the difference between profit and loss, growth and decline, success and failure. In short, IT no longer just supports the business. Increasingly, IT is the business. IT organizations are more important than ever and expectations have grown. In this increasingly IT-centric business world, business leaders want solutions that drive innovation, differentiate the business, generate revenue, scale without limit, and never go down. Chances are you’ve already begun laying the foundation you need to meet these growing demands. You started by virtualizing and consolidating your data center to cut costs. Then you began adding automation to increase availability and speed application deployments. Now you’re taking the next step, layering on cloud-like services, such as automated provisioning and end-user chargeback based on usage. With these tools, you’re streamlining service delivery and cost models far more efficiently than in the past. Yet challenges and expectations continue to grow. Over the next few years, another billion users will be connecting to the Internet with more and smarter devices. You may already be integrating sensors into your products and processes to enhance the customer experience. Read the full The Heart of a Flexible and Efficient Data Center Solution Brief. ¿Qué son las nubes públicas, privadas e híbridas?